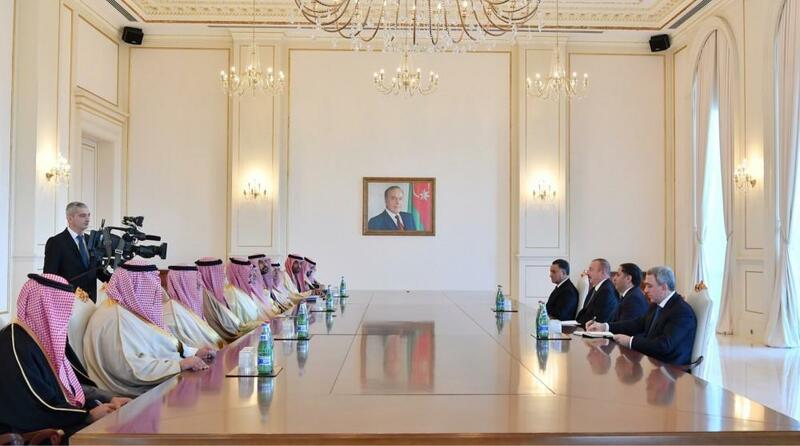 President of the Republic of Azerbaijan Ilham Aliyev has received a delegation led by Minister of Internal Affairs of the Kingdom of Saudi Arabia Abdulaziz bin Saud bin Naif bin Abdulaziz Al Saud. The head of state hailed Azerbaijan-Saudi Arabia relations as excellent, and recalled his visit to Saudi Arabia and his meetings with His Holiness the King and other senior officials. The President said those discussions played a key role in developing relations between the two countries. President Ilham Aliyev pointed out successful cooperation between Azerbaijan and Saudi Arabia in a variety of areas, saying the two counties enjoy high-level political ties and always support each other in international organizations. The head of state expressed Azerbaijan`s deep gratitude to Saudi Arabia for its fair position on the Armenia-Azerbaijan Nagorno-Karabakh conflict, adding that this position is based on brotherly feelings. President Ilham Aliyev said the people of Azerbaijan are well aware that Saudi Arabia has not built any relations with Armenia because of the conflict and occupation, describing this as a brilliant example of friendship and brotherhood. On economic relations, the head of state said very serious steps have recently been taken to ensure development in this field, and expressed confidence that wider measures will be taken towards increasing the investment making and trade in the years to come. Saying the number of Saudi tourists visiting Azerbaijan has recently grown several times, President Ilham Aliyev described this as yet another example of friendship. The head of state also praised a good level of cooperation between the two counties in the field of security. President Ilham Aliyev said he believes that the Saudi Arabian interior minister`s visit will contribute to the development of bilateral cooperation, including relations between the ministries of internal affairs. Minister of Internal Affairs of the Kingdom of Saudi Arabia Abdulaziz bin Saud bin Naif bin Abdulaziz Al Saud thanked the head of state for warm words. He greeted the Azerbaijani President on behalf of Custodian of the Two Holy Mosques, King of Saudi Arabia Salman bin Abdulaziz Al Saud and Crown Prince Mohammad bin Salman bin Abdulaziz Al Saud. He said relations between the two countries are developing, and pointed out high-level coordination on different issues. Describing Azerbaijan as a brotherly and close country and strategic partner for Saudi Arabia, the minister praised cooperation between the interior ministries of the two countries. He stressed the importance of the agreement on cooperation in the field of security signed during the Azerbaijani interior minister`s visit to Saudi Arabia. President Ilham Aliyev thanked for the Saudi King`s and Crown Prince`s greetings, and asked the minister to extend his greetings to Salman bin Abdulaziz Al Saud and Mohammad bin Salman bin Abdulaziz Al Saud.